Long story short, this is a total must read for any Buffy fan, even if you don’t like comics it’s an amazing take on the whole slayer story. Just when you think they did everything in the TV series Joss Whedon (Avengers) brings back the chosen one with a whole new slant. Fray is set in Manhatten a few hundred years in the future. Demons have been replaced and confused with mutants as are vampires who are no longer recognised as the predators they once were. The benefit of setting Fray in the distant future so it could still rest in the Buffy/Angel universe and not effect any of the story. It also gave Whedon the opportunity to turn the world upside down. The original slayer mythology is still there but there is no mention of Buffy and the watchers who once mentored the slayers have almost disbanded in the disappearance of most magic and slayers after an event years before. 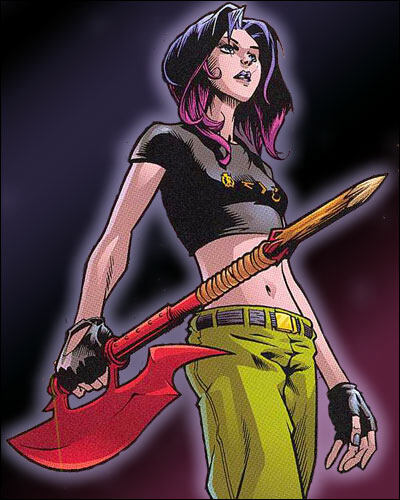 The character Fray seems to be a cross between Buffy and Faith from the series. Karl Moline who did the art work for the series based Fray’s appearance on Natalie Portman crossed with a but of Sarah Michelle Gellar and has done a totally flawless job of bringing the futuristic world to life. Part of the original appeal of Buffy was the combination of girls and monsters, its the similar effect of combining girls and robots which is also awesome and translates well from the original Buffy concept to the comic. Everything that has gone into this book makes it must read from Andy Owens inks brining out Karl Moline‘s pencil work. Colours from Dave Stewart give the story a really industrial futuristic look while playing on the dark nature of the story and every details down to Michelle Madsen‘s lettering which seems to lend a new format to each character, I don’t think I even noticed how much lettering can lend to a story before I read Fray. The book has just had so much love and hard work put into it.